Museumsdorf Düppel (Museum Village Düppel) is a seasonal open-air museum. It presents visitors with a reconstruction of an approximately 800-year-old village. The site of this former settlement has now been reconstructed with residences, storehouses, workshops, fields and gardens. From Easter through to October visitors can experience medieval ways of life and craftsmanship at festivals, markets and other events. Even medieval plants and animals have been bred back and can now be seen in the Museumsdorf. These include the “Düppel pig” and the “Skudde” sheep, a race that is threatened with extinction. We also offer a small exhibition, and programmes for school classes and for groups of visitors. One thing is certain: everyone is invited to get involved! 1967 marked the start of archaeological excavations near the Machnower Krummen fen in Berlin-Zehlendorf. They revealed evidence of building foundations and farmyards of a village from the period just before 1200. Thanks to experimental archaeology, it was possible to rebuild the medieval village on the settlement’s original site. Since 1975 the Fördererkreis Museumsdorf Düppel e. V. has been working onsite. 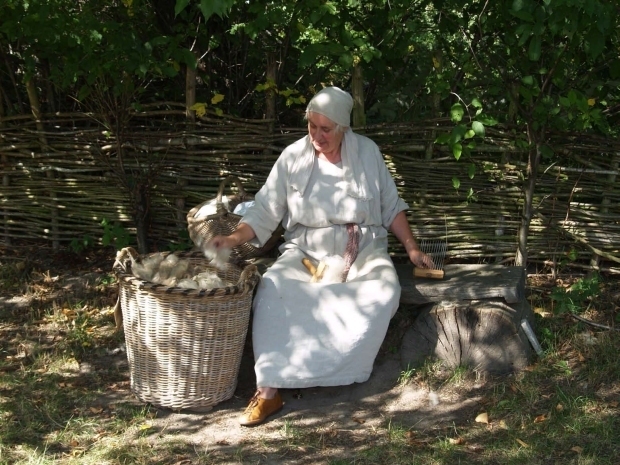 The Museumsdorf Düppel has developed into a widely recognised centre for experimental archaeology. © Fördererkreis Museumsdorf Düppel e.V.